Under capitalism, money imprisons us all, but for one man in Corpus Christi, Texas, this arrangement transcended mere metaphor recently. 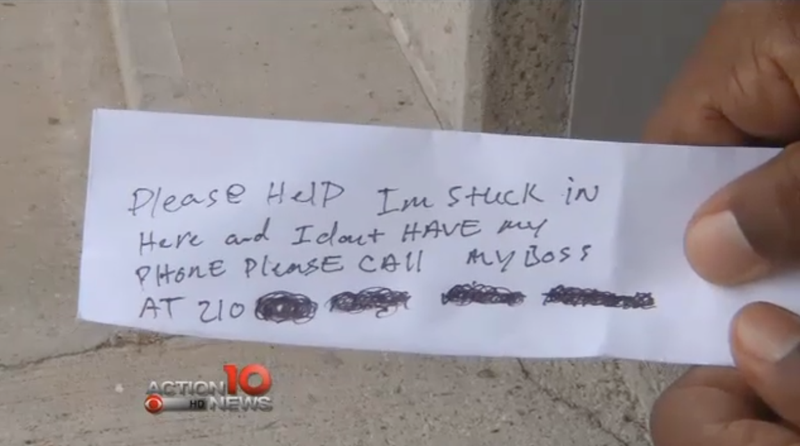 On Wednesday afternoon, the contractor (whose name has not been released) was fixing a lock in a room connected to a Bank of America ATM when, suddenly, he trapped himself in. Having left his phone in the car, he was unable to call for help. So, with an impending Castaway situation at hand, the man had to get creative—or else. Local news outlet KZTV reports the contractor spent the next two hours slipping notes to bank customers at the drive-through ATM that had become his own personal hell. “Please help,” one of the notes read. “I’m stuck in here and I don’t have my phone. Please call my boss…” Apparently, several customers thought the scribbled messages were a prank and ignored them until one patron got sufficiently spooked. When police finally arrived, they were confused by the muffled cries for help they heard coming from the ATM. Sadly, not even the police could free the contractor from the ATM’s clutches. They had to wait until the man’s boss arrived at the scene and managed to let him out at last. At least no one was hurt, except, presumably, the man’s dignity. Pretty much all of them are masterpieces.